US Secretary of State John Kerry launched the Fifth Indo-US Strategic Dialogue on Thursday and met with a number of Indian politicians and lawmakers to discuss boosting bilateral ties, including enhancing defense, energy and global trade cooperation. He will meet with Prime Minister Narendra Modi on Friday. State Department spokesperson Jen Psaki said that Kerry’s visit underscores the importance of the US-India partnership, and “will lay the groundwork for Prime Minister Modi’s September visit to the United States”. According to Ministry of External Affairs spokesperson Syed Akbarudin, India sees great potential for the two countries to develop a global partnership. On his Twitter account he quoted External Affairs Minister Sushma Swaraj, who met with Kerry on Thursday, as saying “Our partnership is based on common fundamental values and converging long term strategic interests”. But Kerry’s visit to India is likely to also focus on a set of grievances Delhi has with Washington. One of the key items is the Washington-based National Security Agency’s snooping on communications in India, particularly on politicians and groups. 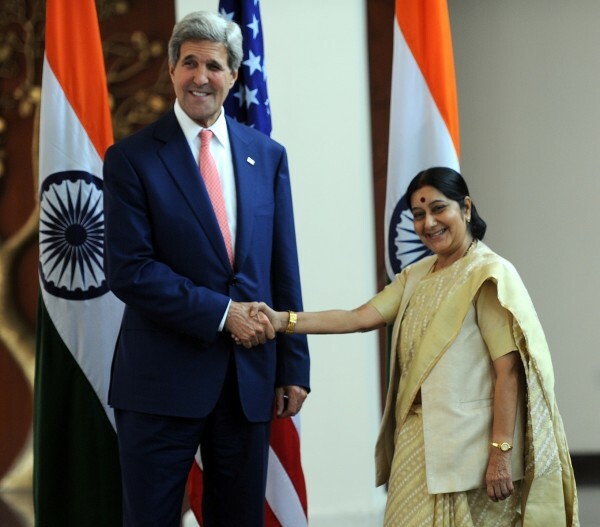 On Thursday, Swaraj told reporters at a joint news conference following her meeting with Kerry and his delegation that she raised the issue of NSA spying with the Secretary of State, and told him that spying on an ally was unacceptable. “I told them that when this news appeared in Indian papers, Indians were agitated and they had expressed their anger too,” she said. On July 2, New Delhi summoned a top US diplomat after reports that the ruling Bharatiya Janata Party was targeted by the NSA in 2010. Earlier, Kerry referred to US President Barack Obama’s efforts to reform NSA operations, and said that Washington and New Delhi enjoy the “best security relationship”. But one sticking point that Kerry hopes to raise with India’s leaders is New Delhi’s opposition to the World Trade Organization’s (WTO) proposed global trade reforms. Last week, citing concerns over food security, India decided not to sign the trade protocol agreed to by WTO members at Bali, Indonesia. The decision was taken after a Cabinet meet headed by the Prime Minister, said Indian officials quoted by local media. The Trade Facilitation Agreement (TFA) of the WTO will come into force from July 2015. The WTO trade pact could add $1 trillion to the global economy. India has criticised the pact for not addressing its concerns of food security. New Delhi has a vast grain stockpiling effort and a 1.3 trillion rupee ($22 billion) annual food subsidy program to distribute subsidised wheat and rice to 800 million people, backing an anti-malnutrition drive that was implemented by the previous Indian government. The subsidies are in breach of the WTO’s specified limits. Kerry told a local network in India that the key – in Washington’s perspective – is to avoid missing an opportunity. “The bottom line is we are very sensitive to, and we care about, and we will work with India,” he said. The US Secretary of State said that the WTO deal was a “test of the country’s commitment to advance economic liberalisation.”. “Right now India has a four-year window where it is given a safe harbor, nothing happens,” Kerry told NDTV. Despite these differences, Washington sees India as a long-term strategic partner and crucial ally. “The United States and India can and should be indispensable partners for the 21st Century, and that is, I assure you, the way we approach the Modi government,” Kerry said in a speech delivered at the Centre for American Progress think tank in Washington earlier this week. hahaha – DC can’t even transform its own warring ways, let alone work constructively with any other country without stabbing their backs. You can’t do good business with BAD people. DC talks the talk and not walk the walk. They have no ones interest in mind except the fascist agenda. PERIOD! They are simply a destructive force.